The partition of the South Caucasus as a result of a series of wars in 1920-1921 was finalized by the Treaty of Moscow signed on March 16, 1921 by the representatives of Soviet Russia and Kemalist Turkey. The provisions of the Treaty confirmed the new borders of Armenia that had just left the Soviet orbit as a result of an anticommunist uprising (see above) and Georgia whose independence was recently recognized de jure by the Allied powers and whose army and militias were still desperately fighting in an attempt to repel the Soviet invasion. During the intensive talks preceding the signing ceremony, the territories of the two nations were partitioned and borders re-drawn in the absence of the representatives of that nations. The Soviet leadership did not even invite to Moscow any representatives of the puppet Soviet Revkoms of Armenia and Georgia. Almost seven months later, on October 13, 1921, the treaty containing basically the same provisions as the Treaty of Moscow was signed in Kars. This time it was signed not only by the representatives of Turkey and Russia but also by the ones representing the Soviet governments of Armenia, Azerbaijan and Georgia. According to the Treaty of Kars, the treaties of Sevres and Alexandropol (see above) were denounced and both the Turkish and Armenian sides agreed to forgive each other all the “military crimes and mistakes” committed by their representatives during all the wars, conflicts and ethnic cleansings of 1915-1920. However, despite the formal renouncement of the technically illegal Treaty of Alexandropol, the Treaty of Kars reconfirmed the Turkish-Armenian boundary outlined in it by leaving Turkey with most of the territories conquered during the Turkish-Armenian war as well as the Soviet-Turkish war against Georgia. Turkey re-gained almost all the territories lost to the Russian Empire during Russo-Turkish war of 1978, except the northern half of Achara (i.e. northern half of the territory of Batum) and the tiny Shuragel (Aghbaba) sector in the north-eastern corner of the territory of Kars. Within the above territories ceded to Turkey were the towns of Artvin, Ardahan, Oqam, Olor, Olty, Poskhov, Sarykamysh, Kaghyznman and Kars. Turkey was also granted the county of Surmala of the former Erevan province to the south of the river of Aras with the town of Ighdyr and the mountain of Ararat (the national symbol of Armenia). The county of Surmala had never been a part of Turkey before, except a short period between 1724 and 1735, and as per the Treaty of Kars, Turkey became the only country among those defeated during World War I that ended up with a territorial gain (see Map 12). Turkey also dropped all the claims to the counties of Sharur-Daralaghes and Nakhichevan of the former province of Erevan under the condition that the county of Nakhichevan, western part of the county of Sharur-Daralaghez (more or less correspondent with Bash-Norashen sector) and a small strip in the county of Erevan with the village of Sadarak, was to become a special autonomous territory under the protection of Soviet Azerbaijan. The creation of a special autonomy in Sharur-Nakhichevan subordinate to Baku was in conflict with the declaration of Azrevkom of December 1, 1920. But that declaration had been revoked prior to the Treaty of Kars, as will be explained below. The borders of the new autonomy carved out of the province of Erevan, were drawn in such a way that it had a land bridge to Turkey (after Turkey got the county of Surmala). Most of the county of Kazakh (according to some sources, the whole of it) of the former province of Elizavetpol. All of the county of Zanghezur of the former province of Elizavetpol. The village of Bashkend (Artsvashen) in the Shamkhor sector of the county of Elisavetpol and some other tiny mountainous territories in the south-eastern frontier of the province Elisavetpol (i.e. the area around Alagel lake). (1) As of today, by “Zanghezur” one usually means modern province of Syunik in Armenia. However, as of 1917-1921, the county of Zanghezur embraced much bigger territory including the strategically important villages of Abdalar (Lachin) and Zabugh. (2) The Armenian possessions in the county of Kazakh remained untouched by the territorial adjustments for a short while as a “cradle of Armenian revolution” where in accordance with the Soviet ideologized history the communist uprising had been staged in late November, 1920. In fact, even pre-Soviet Armenia never claimed the whole territory of that county restricting her aspirations to its predominantly Armenian-populated mountainous part and having little interest to the lower Kazakh with its Azeri-Tatar majority (excluding a few Tat, Armenian and German villages). Most of the Soviet maps depicting Armenia of mid-1921, show her in possession of the county of Kazakh excluding the strip of land between the rivers Kura and the border of Georgia just south of Iori river. Some of the maps of that period, however, show Armenian SSR stretching across Kura and thus embracing the whole county. As of today, it is hard to say whether this discrepancy was a result of poor quality of early Soviet maps or the lack of documentation regarding the borders between the new Soviet republics. We assume that it is quite unlikely that there was any Armenian administration in 1921 that would claim control of the deserted strip of land north of Kura and that is reflected in Map 12 where Kura is shown as the northern border of the Soviet Armenia in Kazakh-Shamshadin. As follows from the above, the Soviet Armenia did not have any formal control of Karabakh during the period specified, contrary to the declaration of Azrevkom of December 1, 1920 in accordance with which Mountainous Karabakh was to become an integral part of Armenia together with Zanghezur and Nakhichevan. As was already mentioned, the Treaty of Kars put Nakhichevan together with some other territories next to it under the protection of the Soviet Azerbaijan, while the desperate struggle of the population of Zanghezur prevented secession of this territory from Armenia. As for the Mountainous Karabakh, its transfer to the Soviet Armenia was revoked by the decision of Politburo of the Communist Party of Azerbaijan (the body de-facto running the Azerbaijani Soviet Republic) of June 27, 1921, and the future of Karabakh was to be decided at the plenary session of the Kavbureau of the Central Committee of Russian Communist Part (Bolsheviks) that started on July 4, 1921. After hours of heated debates, the Kavbureau decided to overrun the 1920 declaration of Azrevkom by leaving Mountainous Karabakh within Azerbaijan and promising it cultural and territorial autonomy . Sixteen days later, the Central Committee of the Communist party of Armenia protested the Kavbureau decision but the protests from Erevan and Armenian-populated parts of Karabakh were ignored by the Kremlin, and even the promised autonomy was not established in Karabakh until 1923. On July 5, 1921, the Kavbureau also failed to define the borders of Mountainous Karabakh in general and the future autonomy in particular leaving it for the future decisions and agreements. The frameworks of this paper do not allow us to make a detailed analysis of the possible reasons for the Kremlin support of the territorial ambitions of the Soviet Azerbaijan at the expense of the Soviet Armenia. We would take the liberty to suggest that oil-rich Azerbaijan could be more important to the Soviet leadership in Moscow as a possible spearhead of their expansionist policies in the Middle East and other Muslim-dominated areas, while the National Uprising in Armenia and especially in Zanghezur, put Armenian loyalty to the new Soviet system in question. Until the end of 1921, the Soviet Armenia also did not include any parts of the county of Borchalo that had been disputed with Georgia since late 1918. The Kremlinite logic behind keeping the whole of Borchalo within the Soviet Georgia was the same as behind keeping the whole of Kazakh within Armenia: the pro-Soviet uprising in Georgia in February, 1921, started in a few ethnically Armenian villages of the sector of Lori (Borchalo county), and ceding that territory to Armenia immediately after the end of Soviet-Georgian war, could question the legitimacy of the Sovietization of Georgia. In late December, 1922 the Russian Empire was re-born under the new name and on the basis of a new ideology (Communism/Bolshevism) through the creation of the USSR – a constitutionally federal socialist state in Eastern Europe and Northern Asia. In fact though, that meant the absorption of some short-lived independent states carved out of the ashes of the fallen empire under the umbrella of the ARCP(B)-run Russian Soviet Federal Socialist republic. In order to soften the loss of formal independence of the new-conquered Soviet republics of the South Caucasus an order was given from Moscow to their leaders to form a pseudo-federation of three units that later were to be incorporated into the Soviet Union - a prototype of the “Global Soviet Republic” planned by the architects of “the world revolution”. It is important to keep in mind that as soon as the short-lived states of the South Caucasus were Sovietized, they were run by the local communist parties that, in fact, were not independent communist parties but constituent parts of ARCP(B), local branches of “highly-centralized political organization directed by a small group of men in Moscow” and bound by strict party discipline. Following the orders from Moscow and Zakkraykom of RCP(B) that replaced the Kavbureau RCP(B) in February, 1922, the representatives of the three Soviet republics of the South Caucasus (Armenia, Azerbaijan and Georgia) signed on March 12, 1922, in Tbilisi the federal treaty establishing the Transcaucasian Federal Soviet Socialist Republic (also known as ZSFSR). Less than a year later, on December 30, 1922, ZSFSR got completely absorbed by the Bolshevik-recreated empire, through signing the Union Treaty that signaled the establishment of the USSR formally and formally subordinated the three Soviet republics (Belarus, Ukraine and the Transcaucasian Federation/ZSFSR) to the Kremlin. The creation of ZSFSR was preceded by a few rather major territorial changes that were supposed to put an end to all possible territorial disputes between the three member-states of the Soviet federation of the South Caucasus. Most of those changes contributed to the territorial growth of Soviet Azerbaijan, except the treaty of November 6, 1921, that gave Armenia the sector of Lori of the county of Borchalo that had been disputed between the two nations since 1918 and finally incorporated into Georgia during Turkish-Armenian war of 1920 (see above) and southern part of Borchalo sector of the county bearing the same name (see Map 13). The above adjustment of Georgian-Armenian border was formally made in accordance with the declared “ethnical principle” keeping in mind that the above territory had mixed Armenian, Russian and Greek population with Armenian majority. Considerable part of eastern Zanghezur including 80% of Dygh sector (only Gerusy/Goris and Dygh remained in Armenia) with the strategically important villages of Abdalar (Lachin) and Zabugh, plus half of Artsvanik sector with the village of Chereli and almost one/third of Katar sector with the town of Zanghelan. The transfer of those territories were made following the already mentioned above “ethnical principle” (the considerable amount of population of the described territory was Kurd and Tatar), as well as in connection with the planned autonomization of Mountainous Karabakh (see below). Mountainous Karabakh: autonomy created, but what exactly was Mountainous Karabakh? On July 07, 1923 after two years of procrastination, the autonomy was finally established in a small territory that, in fact, was only a part of Mountainous Karabakh. It is important to mention that even nowadays there is no consensus on what exactly is Mountainous Karabakh (or Upper Karabakh). From the point of view of the Tatar (Azerbaijani) officials both before and after the Sovietization of Azerbaijan, by Karabakh one should mean the four sanjaks, or the three counties of the former Russian province of Elisavetpol, namely: Javanshir, Karyagino (Fizuli), and Zanghezur that embrace the territory restricted by the rivers of Aras and Kura (in the east and south), mountain ranges of Mrovdagh (in the north) and Zanghezur (in the southwest). The natural western border of Karabakh is the line going from the mountain of Klyshdagh to the mountain of Sarytshly and further to the mountain of Ginaldagh. Since the 16th century, the described territory was nominally controlled by the Khanate of Gyanja of the Persian Empire and since the middle of the 18th century, it was organized into the separate Karabakh Khanate and remained in that status until incorporation into the Russian Empire in 1823. Accordingly, the western mountainous part of that territory could be defined as Mountainous Karabakh. In the early 20-s the mountainous part of the four sanjaks (including the whole of the Highland county of Zanghezur) was also often called “the Armenian Karabakh” due to the fact that its inhabited area was predominantly Armenian-populated although it was also a home of a few Turcic and Kurd-speaking nomadic and semi-nomadic groups. One should add to the above that even during the era of the khanates of Gyanja and Karabakh, the mountainous areas of that region were ruled by local Armenian Meliks (Princes) thus existing in the form of several semi-independent feudal mini-states among them Khachen, Jraberd, Varanda, Dizaq and Tsar. From the Armenian perspective, the above-mentioned territory was not the whole of Mountainous Karabakh because Armenian political and intellectual elites of the period described, considered the former Khanate of Gyanja (Gandzak) a part of historical Kabarakh thus denoting most of Gyanja county of the province of Elisavetpol between Mrovdagh range and Kura river as “Northern Karabakh”. Accordingly, the mountainous part of Gyanja county between Shakhdagh range and the chain of villages including but not limited to Karatschinar, Agjakend (Shaumianovsk), Borisy, Erketch and Chaykend on both banks of the river of Geran, was considered a part of Mountainos Karabakh and often referred to as “North Artsakh”. The described territory was even more homogenously Armenian than Mountainous Karabakh south of Mrovdagh, local Armenians spoke the same dialect that was used in the mountainous parts of the three sanjaks, and historically the above area was the core part of the Armenian melikdom of Gyulistan. Additionally, another mostly Armenian-populated part of the county of Elizavetpol (Gyanja/Gandzak) described above as “the unknown Armenia” was lying to the west of North Karabakh and included the Armenian villages of Ajikend, Mirzik, Bayan, Dashkesan, Kushtshi, Zaghlik, Barsum and Tshardakhly. That area is often referred to as the continuation of Northern Karabakh or as North-Western Karabakh or Parisos. is also close to Mountainous Karabakh both historically and linguistically but in contrast to Karabakh Armenians, the Armenians of Parisos did not attempt to incorporate their lands into the Armenian Republic and thus that territory was from the very beginning excluded from the “autonomous Karabakh”. It might be also worth mentioning that the chain of Armenian towns and villages of Northern Karabakh looks on the map like a long enclave with a reasonable chunk of Azerbaijani territory between them and Armenia. That impression could be calibrated though, if one bears in mind that most of the area south of that chain of Armenian settlements and almost until the coast of lake Sevan, was practically uninhabited Highland area that remains sparsely-populated even at present. Following the decision of Kavbureau of July 1921, it was expected both in Karabakh and in Armenian SSR that the autonomy would be granted to all Mountainous Karabakh including Armenian-populated areas of Northern Karabakh. However the reality happened to be quite different from Armenian aspirations. Declared on July 7, 1923, the autonomy of a part of Mountainous Karabakh did not become reality not until the end of November, 1924. The borders of the new autonomy were carved by the Soviet leadership of Azerbaijan with no participation of Armenian representatives. As a result, only small part of historical and geographical Mountainous Karabakh was granted limited autonomy within Azerbaijani SSR. The new autonomous unit officially called AONK, completely excluded any Armenian-populated parts of North Karabakh as well as a few western and southern straps of land that were geographically and ethnically parts of Mountainous Karabakh within the four sanjaks (see above). Those straps of sparsely inhabited Highland land with the small towns of Abdalar (Lachin) and Kelbajar as well as a few villages squeezed between the new-established AONK and Armenian Zanghezur, became parts of the Kurd autonomy established on the same day as AONK, on July 07, 1923. The history of the autonomous “Kurdistani County” (also known as “Red Kurdistan”) is short and unclear most of the documents referring to its existence are either destroyed or “classified” both in Azerbaijan and Russia. Unclear are also the reasons of its creation. In any case, the frameworks of this article do not allow us to go into the details of the history of the “Red Kurdistan’, but it is quite evident that one of its function was to create a Muslim buffer between autonomous “Armenian Karabakh” and the rest of Armenia. The county included not only westernmost parts of the former counties of Javanshir, Shusha and Karyaghino (now Fizuli) but also most of the lands transferred from Armenian Zanghezur to Azerbaijan in 1921-22, and the recently Armenian town of Lachin became an official capital of the Kurdish autonomy although most its governmental offices were located in Shusha. If one looks at some of the maps of the South Caucasus published in the USSR between 1923 and 1925, one may notice that despite the fact that on some of them the town of Lachin (Abdalar) did not belong either to Armenia, or to AONK, the Karabakh autonomy was still not an enclave and had connection with Armenian Zanghezur at least at the village of Zabugh, through which ran a road that connected the two mountainous regions. If one tries to compare various maps of the area published during the 20-ies, one gets an impression that the borders of AONK were regularly redrawn. On the other hand, the jurisdiction of the major towns of the autonomy and around it remains the same. As of today, it is extremely hard to say whether this discrepancy is a result of bad cartography, or the administrative borders were not clearly defined. The problem is aggravated by the fact that both the military topographic maps of the area published during the described period, and the documentation related to the re-carving of the counties and other administrative units is still classified and not accessible to the researchers. In any case, basing on the maps that still exist and be found in the libraries as well as on the research made by Robert Hewsen, Tim Potier and Artur Tsutsiev, AONK had connection with Armenia in Zabugh at least until 1926. The years of 1925-36 saw some more changes on the administrative map of the South Caucasus especially in Mountainous Karabakh and around it. During eleven-year period that ended up with the dissolution of ZSFSR on December 5, 1936, the soviet republics of the South Caucasus went through several re-organizations of their administrative divisions. In Karabakh that process resulted in the abolition of Kurdish autonomy on April 98, 1929 and its restoration on May 25, 1930. Re-establishment of “Red Kurdistan” was accompanied by significant territorial increase: in the south, the autonomous county gained Zanghelan area and reached the river of Aras thus gaining direct access to Iran. Near its capital (Lachin area) the Kurdistani county was supplemented with Zabugh thus cutting AONK off from Armenia, as well as with the villages of Minkend, Bozlu and Bayandur apportioned from Armenian Zanghezur and a small area around lake Alagel. Despite the territorial growth of “Red Kurdistan” it lost considerable amount of Kurd population through migration, famine, political repressions and assimilation. The autonomy and especially the town of Lachin were heavily settled by Azeri Turks (Tatars) who were brought there from various parts of Azerbaijan. Finally, on August 8, 1930 the Kurdistani autonomy was abolished for the second time. Now AONK became an isolated enclave surrounded by Azerbaijani territory. In 1925-36 Armenia was forced to cede other territories to Azerbaijan including a few villages in Zanghezur (finally leaving Armenia with only half of the pre-1921 Zanghezur county), and a few villages in Shamshadin around the town of Artsvashen (Bashkend) turning it into an Armenian enclave inside Azerbaijan. At the same time, the village of Arpa, previously given to Nakhichevan ASSR (see above) was returned to Armenia thus restoring connection between Erevan and the towns of Zanghezur (See Map 14). One can say that by the end of the 30-ies the borders between Armenia and Azerbaijan were finally stabilized and started looking approximately the way they looked prior to the escalation of the Karabakh conflict in the mid-80ies. The finalized borders, however, satisfied neither Armenians, nor Azeri Tatars. 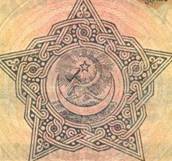 (at that tine the word “Tatar” or “Azeri Tatar” was replaced with the term “Azerbaijani” or “Azeri”). Atlas Istorii SSSR, Part III, ed. K.V. Bazilevich et al. (Moscow, 1950), pp. 30-31. A.Tsutsiev, Atlas Etnopolitichesko Istorii Kavkaza: 1774-2004 (Moscow, 2006), p. 63. (février-mars 1921)”, Revue Historique des Armees, No. 254 - 1, 2009 (Paris, 2009), pp.68-70. M. Volodarsky, The Soviet Union and its Southern Neighbours (Ilford, 1994), p.ix. mountainous territory approximately corresponding to modern Kelbajar district (Auth. ).